In previous e-books in this series, we focused on the planning and doing phases of an ergonomics process. This e-book focuses on the final step which includes conducting an audit of your ergonomic improvement process to determine progress, how well you are meeting your plan and standard, and to determine if any changes are needed to improve the process. 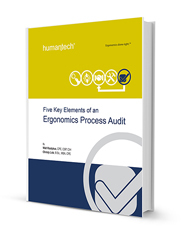 Humantech’s complimentary e-book is the last in a five-part series that will focus on how companies can build and sustain a successful, world-class ergonomics process or, as we like to say, “do ergonomics right.” It covers step five of Humantech’s Engagement Model, Review. Completing the review of your ergonomics process is a milestone. It indicates when you have moved from deploying the process to sustaining the process. What is a process audit and how is it conducted? How do I select process auditors? What is the key criteria that must be included in an audit?